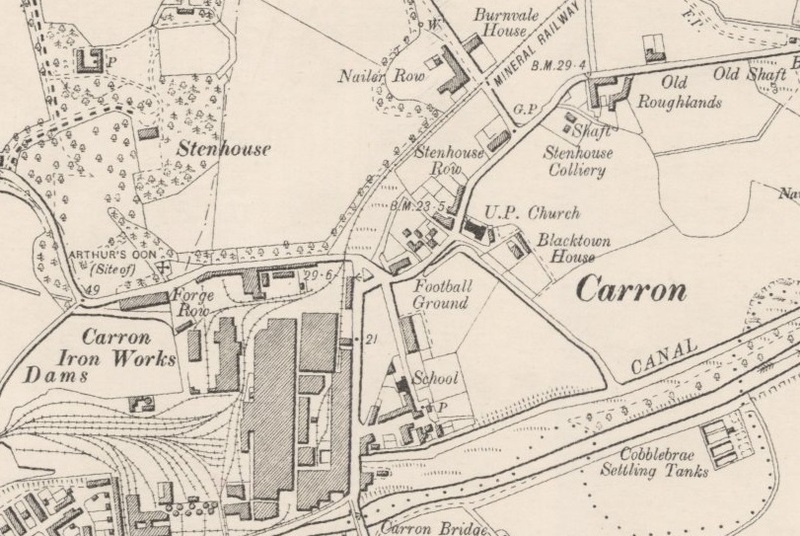 The home ground of Carron FC [1884-1888] was Inns Park, neither of which names have remained with us through history. To be fair Carron were never a great club, I'm not sure most people would class them as a Senior Club since they never played in the Scottish Cup. But they did play with the 'big boys' in the Stirlingshire Cup & Falkirk District Cup, so I would err in their favour. Inns Park though, was not just the ground of Carron FC though, the inter-office matches of the Carron Works were also played there, and for a while these were very popular. Which leads to the possibility that Carron FC, if not a works team, was heavily linked with the Iron works. It was a major employer in the town and a disproportionately large number of players came through the ranks of Carron FC to the bigger clubs than other clubs of a similar size. I am not 100% sure that the earliest recorded matches in Carron were played at this ground, but there are not many other places in Carron where a game of football could easily have been played, so it is probable. The only thing that caused the local press to mention Inns Park was when Brockville Park & Merchiston Park were occuped by the First Team and Reserve matches, Inns Park often hosted the 3rd XI fixture. Inns Park [1897 OS Map] via NLS Maps.